As far as pickles go, this is where it all started for me. A really simple recipe handed down through the generations (-well, generations of in-laws, at least). It’s that time of year when the nights are closing in, the weather’s even wetter and colder than it was in the ‘summer’, and what’s left of the summer veg is debating whether it’s worth hanging on for just a few more days, or give up to the end of season malaise. If you haven’t done so already, now is the time to go out and strip off all of the tomatoes, regardless of their condition. Of course, you can finish ripening tomatoes indoors, but if you have a lot, chances are many of them will be lost long before they are ready to eat. 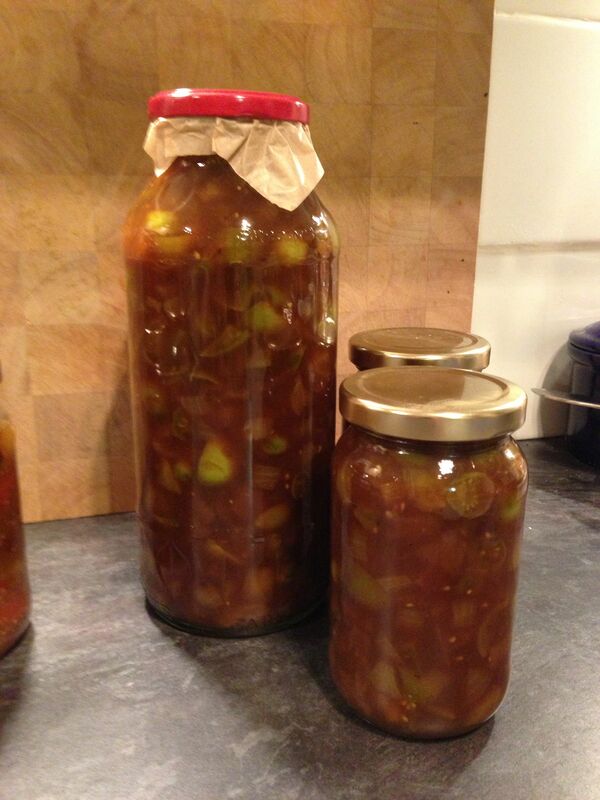 A great way to get through a large backlog is to preserve these for the coming months as a Green Tomato Chutney – this is my traditional family recipe which is really terrific!